It wasn’t that long ago (yesterday, actually) that I was writing about the slow slog the grocery supermarket sector was having toward mobile utility. About a fifth of shoppers have downloaded a food shopping app, usually related to their supermarket. It remains unclear what the level of usage is among those who did download these things, of course. But it bears mentioning that one of the pipe dreams among the downloaders of supermarket apps was that they incorporate price comparisons so shoppers can scope a good deal. Yeah, well we don’t live in “Miracle on 34th Street,” where Macy’s decides sending people to Gimbels is good for branding. ShopRite is not sending you to Giant. No way, nohow. As serendipity would have it, the deal-finding consumer site Savings.com today is launching Favado, a subsidiary and app that in fact gives shoppers visibility across local groceries and drug stores for the top deals and comparative pricing. I only had a few minutes to play with it myself, but the app was cleanly designed and self-explanatory. It found my local stores and allowed me to designate the ones I frequent. Then it allowed me to search categories and products easily to find items, make shopping lists, store coupons and find other relevant deals. The company says it made this spinoff brand because it saw consumer desire for digital grocery couponing on the rise at its own site, which was aimed toward other non-perishable goods. Earlier this year it developed a beta product that embraced 10 stores in Ohio and Indiana markets. They reported that in that test the average user spend 2-3 minutes with the app per session and compared across 6 stores in order to add about 17 items to their list weekly. More to the point, the return rate generally was several times a week to check on sales. Interestingly, much of this is people-powered rather than simple circular or digital coupon scraping. The company has deal finders in key markets who they say updated 40,000 items from 100 chains weekly. In my use I found that for the Northern Delaware market the items in the database were selective at best. This could change over time as the service gets more data inputs. Still, it is exceptionally well designed, with clear paths of functionality outlines by the app the first time you use them. To be sure, this is the kind of app that likely finds that audience of people predisposed to be proactive shoppers, or what you might call the semi-pros. It makes the process of deal-chasing a bit easier and might capture the interest of those who are marginally obsessive about ensuring they don’t overpay for a chunk of cheese. But it is an interesting exercise in using mobility, connectivity and app platforms to serve a certain kind of shopping behavior. If any of you have lived with a pro-am grocery shopper, you know that food shopping can be an all-day affair involving a nylon wallet of coupons and trips to at least three to four supermarkets…in order to save $5 or $10. This is the app for them. And I hope it keeps them company, because I bailed on this behavior long ago. The math never worked for me. 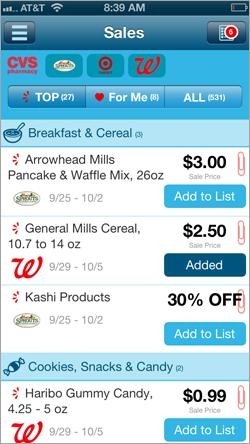 1 comment about "Savings.com's Favado App Is Crack For The Coupon Addict In Aisle 4". Casandra Mead from Independent Consultant, October 15, 2013 at 12:18 p.m.
Shopping apps are getting more and more popular - I have found that Shopular is pretty useful and simple. It is alot like Favado, but the presentation is more visual.